During the test campaign, several successful interceptions were carried out at sea against Grad rockets. According to senior air force and navy officers, the interceptions were successful both when it came to single launches and to barrages of projectiles launched as part of the test. The tests of the Tamir Adir Missile Defence System, as it is being called, proved its ability to operate on a highly dynamic, moving platform. Multiple short-range rockets were fired from the shore. The Adir radar identified and targeted them with the Tamir missile system. It was previously revealed that the Tamir Adir system would be capable of working along with the Barak 8 missile defence system, which can eliminate sea-skimming missiles and aerial platforms. Therefore, it will offer a complete air defence protection of the fleet and of the maritime assets. The IDF explained the system was created to bridge the operational gap in protecting the rigs over the next two years. The shrtfall in the defense of the rigs was created as a result of expected delays in the arrival of new defensive ships from Germany. The next step will consist in testing the C-DOME Naval Point Defense System from a ship VLS at sea. 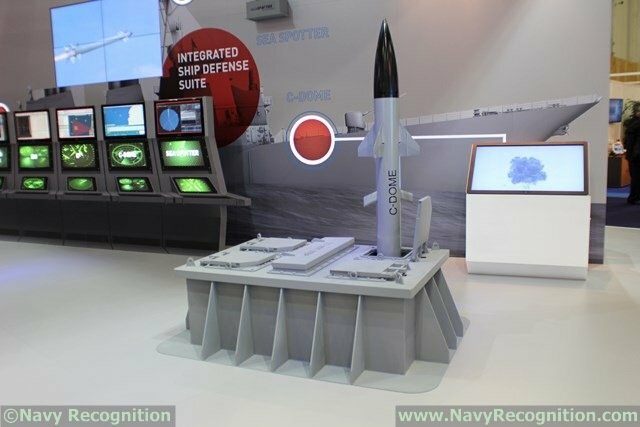 C-DOME, the naval variant of Iron Dome was unveiled at Euronaval 2014. Rafael's C-DOME is designed to effectively protect combat vessels against a large set of modern threats. C-Dome handles saturation attacks by engaging multiple targets simultaneously. Reaction time is very short and enables automatic and semi-automatic engagements. C-Dome components include a multi-round launcher assembly loaded with vertically-launched canisterised interceptors. The launcher is installed under the ship deck. The future platform for C-DOME will likely be the Israeli Navy Sa'ar 6 MEKO A100 Corvette which is expected to be heavily armed: Likely 32x VLS cells for surface to air missile system Barak 1 by Israel Aerospace Industries (IAI) and C-DOME naval point defense system by Rafael, 16x anti-ship missiles and the MF-STAR multifunction AESA radar by IAI.